Below are all homes for sale in Hunter Glen subdivision, located in Zionsville, Indiana. All active listings are updated twice per hour, every day, with data from the Metropolitan Indianapolis Board of Realtors MLS/BLC. Add any of these Hunter Glen homes to your favorites, sign-up for price reduction alerts and save searches. Get Hunter Glen automated home sale updates. 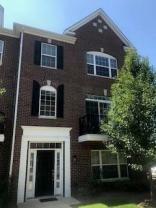 All the comfort of a spacious townhome with superb sized KT, DR, and GR on main floor. All Appliances Included! Currently tenant occupied until 6/14/2019. Great investment opportunity.